Comments: In breeding plumage individuals of this small species have pale gray napes, dark throats extending under their slim, straight bills and small white patches on their backs. In nonbreeding plumage look for a black back, dark gray hind neck and a dark “chinstrap” across a predominantly white throat. Young birds have napes that are paler than their backs. There is a sharp contrast with a straight border between the white throat and nape. Unlike Common Loons, Pacific Loons do not have white around the eyes. 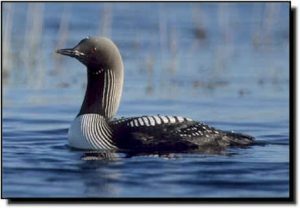 Reports of Pacific Loons in the central Great Plains have increased in recent years, although they are still not common. Look for migrating individuals on reservoirs.